BAM blog: Artist José Parlá on "Gesture Performing Dance, Dance Performing Gesture"
Artist José Parlá on "Gesture Performing Dance, Dance Performing Gesture"
Listen to Brooklyn artist José Parlá discuss his mural "Gesture Performing Dance, Dance Performing Gesture," commissioned by BAM for the Fisher Building. 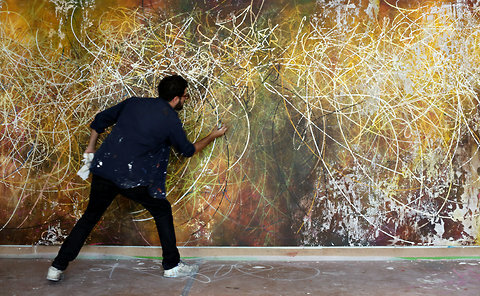 José Parlá: Hi, I'm José Parlá, and I'm the painter that made "Gesture Performing Dance, Dance Performing Gesture." I started to look at a lot of the videos and archives of Brooklyn Academy of Music and imagine myself as the vehicle [of] the many performances that have happened at BAM. So [I did a dance to every line] while I painted this mural, and if you follow the lines with your eye, your eye dances. You can follow a rhythm, you can even imagine the sound of music, you can imagine a performance. There was no sketch, there was no premonition of what it's going to look like. It's all very free flowing. I layered the painting [...] over a period of months. That first layer was just solid color. But while it's completely wet, I attack the whole piece with a brush only loaded with water, and the water seeps into whatever mark I'm making and in about 10 minutes while the water seeps in, I run and get rags and then [...] scrub the piece down so it creates this luminosity or negative of what was written or drawn onto it. I did that first layer and then I waited for everything to dry and then I sanded it. At that point I started cutting the ends of tubes of paint and emptying them out and mixing colors and then filling the tubes again with new original colors and then started squeezing paint out of the tubes as [I moved]. And so you'll notice that the strokes of the lines are very thick in texture. Although they look like they've been made really fast, they're actually really thick also. I built that up over three months. The lines ended up representing performers and dancers. And if you see the movement from left to right, it feels like legs and arms extended, and heads and people and histories and stories. BAM is not just a place for theater and music and performance, but also for visual arts. When I look at the painting, BAM is reflected [...] because it's an homage to all the performers that have [appeared there throughout its history,] and it's also a homage to Brooklyn and the neighborhood, being that I'm also very proud that I'm from this neighborhood. I also think about the many times I came to BAM years before I was ever commissioned to do this mural, so it's a really personal and special piece for me to look at as an artist. Sehr schöne Post. Danke für einen aufschlussreichen Beitrag. Diese Tipps sind sehr hilfreich. Nochmals vielen Dank, dass Sie Ihr Wissen mit uns geteilt haben. Tanzen ist einfach technisch wie Sie nur eine Abfolge von Schritten folgen müssen, auf der Grundlage der Art von Tanz Sie lernen. Ich verehre Salsa-Tanz! Salsa ist eine einzigartige Form der Übung, weil es die Herz-gesunde Vorteile einer Aerobic-Übungen bietet, während auch mit dem Sie in einer sozialen Tätigkeit zu engagieren.